Okay, you finally got the approval to buy some marketing automation software – now what? Using marketing automation software means you now have a wealth of tools at your disposal, so the smart move is to make sure they’re all working for you. 1. Organize your content and create a method for auditing what works or doesn’t work. First, silo your web content into three categories: Features, Educational Content, and Front-Facing Sales Content. Next, create a standardized process for gating your collateral behind a simple form that collects user emails. Standardize which form fields will be mandatory or optional profiling fields. Finally, create exit and entry paths for your nurture programs that are triggered when your gated content is consumed. You can now start tracking which sources are successfully driving traffic to your content and which users are consuming that content or engaging in other ways. Meaningful interactions like watching a video or downloading an ebook, as well as users’ inferred level of interest and demographic data, can be used to rank users, continue engaging them with a nurture campaign, and eventually convert them to qualified leads to be handed off to the sales department. This also enables you to assess what isn’t converting and improve it, tweak it, or even eliminate it. If, for example, one of your videos is played half as often as the others on your site, you might consider changing its placement on the page, adjusting its headline, or replacing it with another, higher-converting video. 2. Leverage your CRM’s capabilities to track activity and improve lead attribution. Many sales and marketing teams report separately, meaning that you’re often left trying to make sense of different report systems and data sets to get an overall picture of your reporting. Instead, what if you could use your marketing automation reporting features to view sales and marketing statistics together? Integrating your marketing automation software with your CRM will enable you to view statistics side-by-side so you can track which leads converted to contacts, and so on. CRM integration also makes it a breeze to attribute leads to the sources, campaigns, and team members involved. This not only eliminates squabbling between the marketing and sales departments, but also helps you to look at the ROI of each marketing campaign or sales initiative. Decisions become proven and data-driven rather than just hunch-driven. 3. 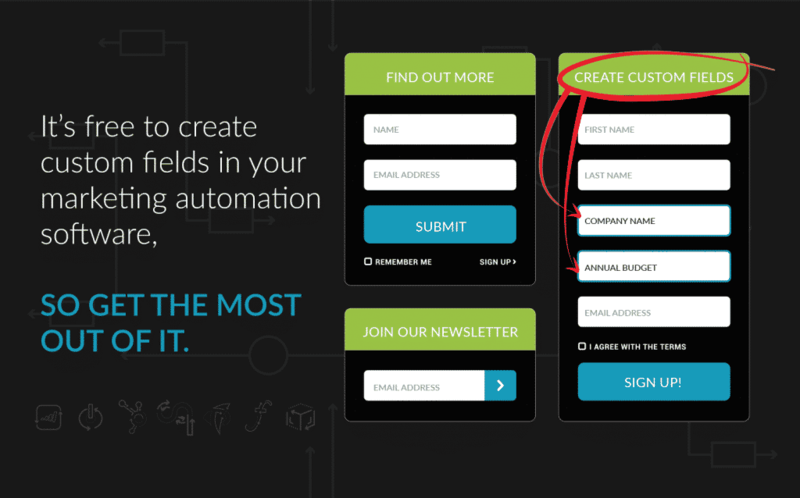 It’s free to create custom fields in your marketing automation software, so get the most out of it. Don’t make the mistake of failing to track your data just because it doesn’t fit into one of the standard fields offered by your software. Most marketing automation platforms offer the option to create custom fields for free, so take advantage of this tool by creating a way to track any piece of data that will be helpful to your marketing or sales teams. You can create custom fields for everything from activity timestamps to a lead’s annual budget. The values of these custom fields will update in your integrated CRM in real time, so your sales team will be able to utilize fresh data to optimize their performance. And, remember, you aren’t required to integrate every field with your CRM – so you can create custom fields that will lend insight to your marketing team but would be extraneous for the sales department to see. Remember not to be shy with the data you choose to track. If you’re not collecting enough data today, you won’t be able to run successful marketing automation reporting tomorrow. About HyperX: We’re the marketing experts. We’ve been leading the industry in marketing automation and content marketing since the internet first hit households. We’ve outlived all the other agencies because we’re the best at what we do. We can help you with your marketing automation reporting so you get the most bang for your marketing buck.